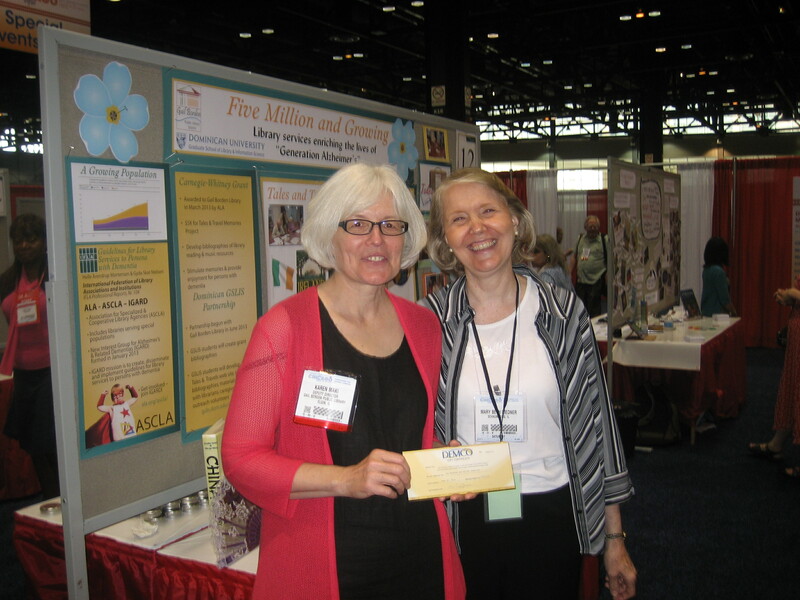 First place in the Diversity and Outreach Fair at the ALA Annual Conference in Chicago on Saturday, June 29 was awarded to the Gail Borden Public Library of Elgin, IL for their poster entitled “Remember Me: Serving Persons with Alzheimer’s and Dementia.” The Fair is hosted annually by ALA’s Office for Literacy and Outreach Services (OLOS) and is generously sponsored by DEMCO. The theme of the 2013 Diversity and Outreach Fair was Removing Barriers to Service for All: Creating Meaningful and Integrated Library Experiences for People with Disabilities. The winning poster portrayed an innovative program entitled Tales & Travel that brings residents of memory care facilities into close interaction with a wide variety of library materials. The monthly programs focus on a different country or region of the US. Library staff and volunteers invite the residents to go on an imaginary journey to the chosen destination. The location of the country is shown on a globe or world map. The residents then take turns reading aloud from a folk tale, myth or legend from the area, followed by five interesting facts about the location. Finally, they browse through highly illustrated non-fiction books about the area from both the adult and the children’s collections. Music from the destination country can be played in the background. Residents truly enjoy the program and stay engaged for the full hour. Also noted on the display was the Carnegie-Whitney grant awarded to the Gail Borden Library to develop a series of bibliographies that will serve as a model for other libraries interested in replicating the Tales & Travel program. Dominican University’s GSLIS program is partnering with the Gail Borden Library and has provided a webpage (http://gslis.dom.edu/about/tales-and-travel-memories) where the bibliographies and other resources will be posted as they are created. A new ASCLA Interest Group for Alzheimer’s and Related Dementia was also highlighted on the poster. This Interest Group will focus on developing guidelines for library services for this often forgotten population. A starting point will be the Guidelines for Library Services to Persons with Dementia that were approved by the International Federation of Library Associations (IFLA) in 2007. Any ASCLA member interested in joining this Interest Group can find out more by going to http://connect.ala.org/ascla_igard. The Hartford Public Library won second place at the Fair for their entry “We Belong Here.” Third place was awarded to the Brooklyn Public Library, The Child’s Place for Children with Special Needs for their display entitled “Bridges to Autism”. For those unable to attend the conference in Chicago or who missed the Diversity and Outreach Fair, more information about the 27 entries is expected to be posted at http://www.ala.org/offices/olos/divfair/diversityfair.